Jointly Create History At Phuketon 2017 | JustRunLah! Jointly create history at Phukethon 2017, Thailand’s biggest marathon festival with three historical routes for runners to challenge their limits and conquer “Promthep Cape” between December 8 and 10 at Saphan Hin, Phuket. Phuket in cooperation with Move Asia, the organizer of world-class events, and Yoshimoto Entertainment (Thailand) have enhanced its newly-gained reputation as one of Asia’s sporting cities by holding an inaugural “Phukethon 2017”, a marathon festival where runners across the world can challenge their limits in three historical routes “THE CAPE-THE BAY-THE OLD TOWN” and have a chance to prove themselves by conquering Promthep Cape. The event running between December 8 and 10 at Saphan Hin also incorporates Running Expo, Food & Music Festival and fun activities. TV stars led by Khemmanit “Pancake” Jamikorn and Yossavadee “Yo” Hassadeevichit will also feature in what is expected to be a large gathering of high-profile athletes from the country and abroad. On September 5, 2017 at Promthep Cape, Phuket’s Muang Distric, Phuket governor Norraphat Plodthong, lt Col. Ruj Saeng-udom, the Sports Authority of Thailand deputy governor, Riduwan Matni Managing Director Move Asia Co.,ltd. and Boonperm Intanapasat Race Director Move Asia Co.,ltd. attended in Phukethon 2017 Official Press Conference, the country’s first-ever marathon festival, along with representatives from sponsors, Ekarat Jenkijjaroenchai Marketing Communication Department Officer of A.P. Honda Co.,Ltd., Nattisiri Chontisirisin Marketing Department Manager of Sponsor Electrolyte Beverage, which attracted a large group of Thai and foreign media before the event will be held between December 8 and 10 at Saphan Hin. As the host city, Phuket governor Norraphat Plodthong commented on the province’s readiness to welcome marathoners from across the world. “Phuket hopes to become one of Asia’s leading sporting cities under the government’s policy. 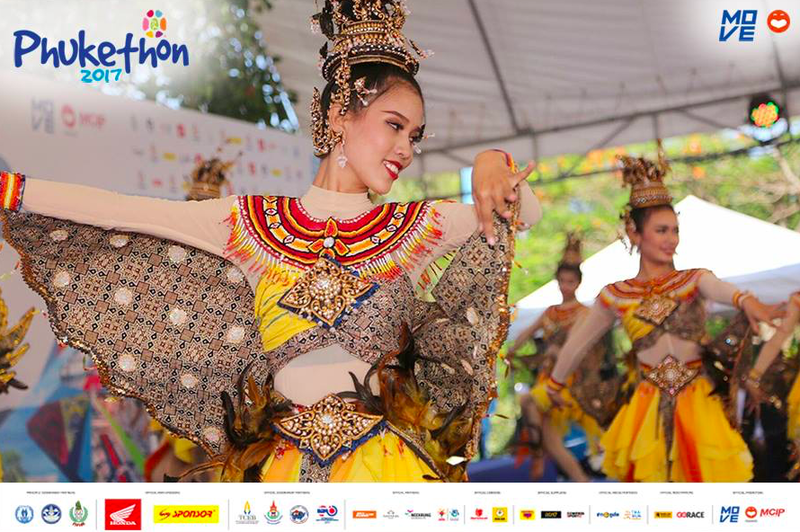 Therefore, we co-operated with all parties in hosting Phukethon 2017, a running tourism festival held under the “Longer Stay At Sport Day” concept. 1. THE CAPE (full marathon 42.195km) is the most challenging route because the athletes have to run up the slopes ranging between 20 and 25 degrees slope. The highlight is the halfway U-Turn point as the runners need to run uphill from Rawai Beach to Promthep Cape, a famed viewing spot situated 200 metres above sea level, before heading to Suriyadech circle in the heart of Phuket city. Choosing this route, the marathoners should have a good preparations in order to prove themselves on the paradise island. 2. THE BAY (half marathon 21.1km), the marathoner who chooses this route will return at Makham Bay. Visit Panwa Port, View point of Makham Bay overlooking the emerald green sea and panoramic view of cape panwa. 3. THE OLD TOWN (mini marathon 10km), runners can savour the charm of Phuket’s old city with a history of more than 114 years along this route. They can see many historical places including the Sino-Portuguese architecture that was first built in 1903, Surin Circle Clock Tower, one of the province’s landmarks, the Standard Chartered Bank branch, the first ever bank to be built in the Kingdom back in 1907 and Thalang Road studded with shops and restaurants. More importantly, Phuket will announce December 10 as a “car-free” day in order to support and facilitate the hosting of the marathon. All the roads in the city will be closed for six hours. 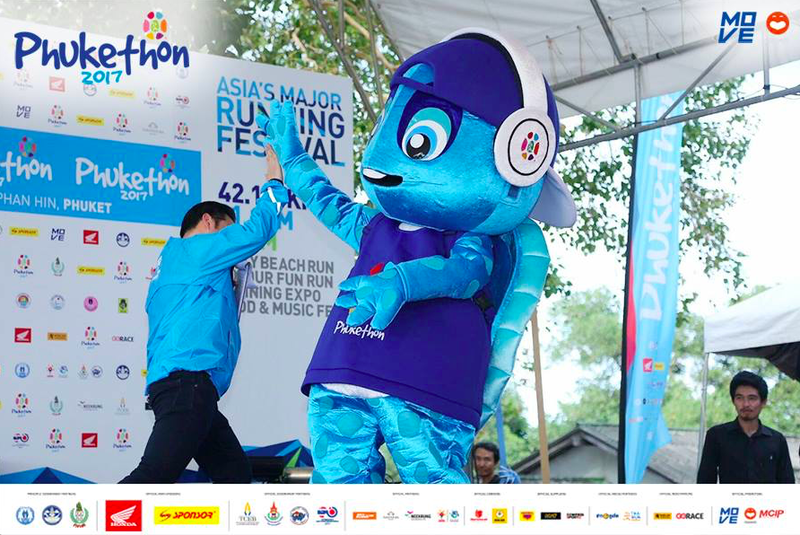 Furthermore, as the running festival, there are many more special activities for participants to enjoy themselves such as “Colour Fun Run” (5/2/1km) to be staged by Thanyapura, the country’s biggest sports training center with world-class facilities and “Jelly Fish Beach Run” in which runners can enjoy running on Nai Harn Beach and watch giant wind turbines, the province’s newest tourist attraction. There will also be more than 100 booths at the Running Expo running between December 8 and 10 led by REV Runners, the distributors of top running brands including Asics, Under Amour, Altera, On, HOKA, Saucony, la sportiva, Vibram and other apparels. Musical & Food festival will be held as well under the “Fisherman Village” concept, where runners can carb load amid nice music prior to the race. “All this happened as a result of a collaboration between government and private sector; the Sports Authority of Thailand, Phuket province, Phuket Provincial Administrative Organization, Phuket Municipality, Rawai Sub-district Municipality, Vichit Sub-district Municipality, Chalong Sub-district Municipality, Phuket Rajabhat University, Phuket Public Heath Office, Phuket Provincial Police Station, Tourism Authority of Thailand’s Phuket Office, Phuket Tourism Industry Council and Phuket Disaster Prevention and Mitigation Office, in an effort to attract more tourists to Phuket,” said Norraphat. Lt Col. Ruj Saeng-udom, the Sports Authority of Thailand’s deputy governor, said of the origin of the pioneer event to develop the country’s sports industry. 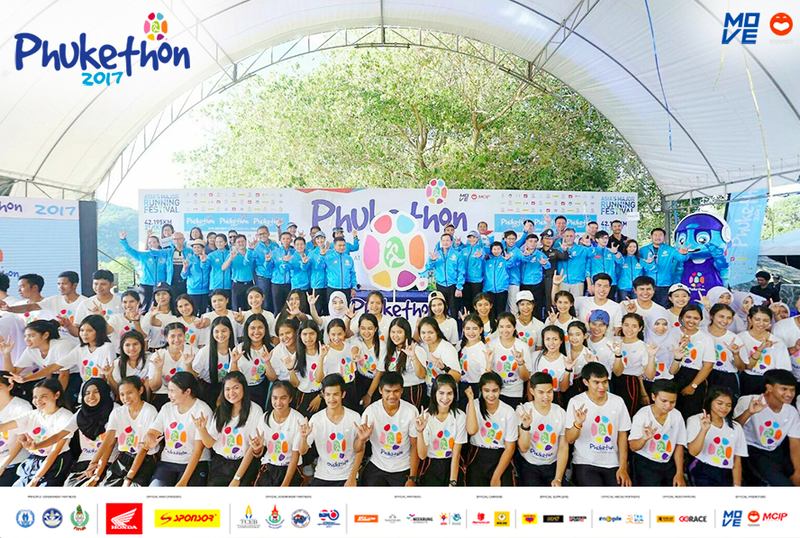 The Ministry of Tourism and Sports and the Sports Authority of Thailand have a great pleasure to play a part in supporting Phukethon 2017, which would be a model in developing Thailand’s sports industry by using mass sport to create a big event like this to welcome runners from around the world. 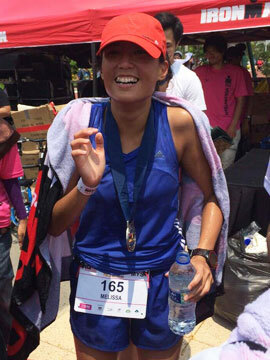 “Running a marathon is now very popular among foreign tourists around the world and Thai people. This running festival would elevate our tourism and attract new group of tourists to Phuket and the country. The foreign tourists would be brought in to spend money in our country, which would in turn boost the economy in accordance to the government’s sports tourism policy. It is believed that a lot of athletes would come here along with their families, which would generate massive flow of money in the economy during the event. The International Association of Athletics Federations (IAAF), the Asian Athletics Association (AAA) and the Athletics Association of Thailand (AAT) have already certified the routes of Phukethon 2017. We also had the guy who measured the distance of the route at the 2016 Olympic Games in Brazil to measure each of our routes this time. Boonperm Intanapasat, the race director, Move Asia Co.,LTD, gave the details of the event. 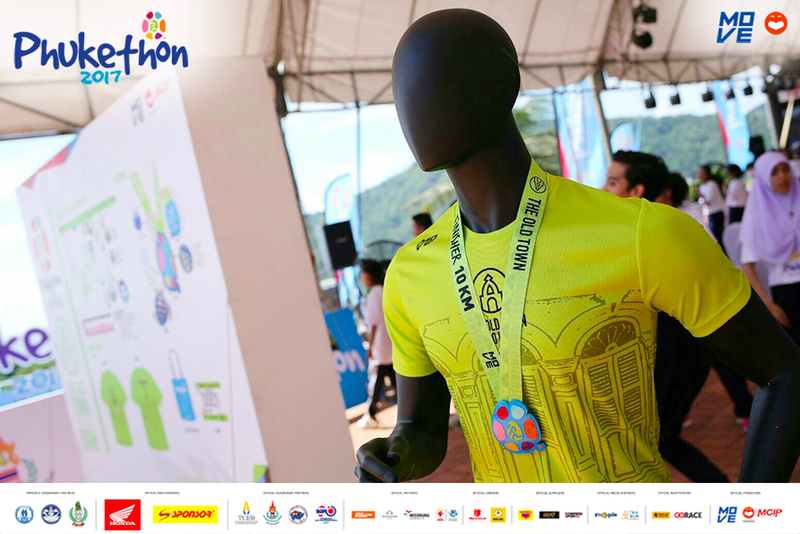 “We expect to welcome not less than 10,000 runners at the Phukethon 2017. To attract and welcome more local athletes to participate in Phukethon, we offer special tickets, which are cheaper by almost 50 percent for runners from 14 southern provinces. Currently, more than 3,000 athletes from running associations in Southern region already confirmed their participation. Besides, we’ve secured partnerships with other running events in Asia such as Okinawa Marathon in Japan by collaboration with Yoshimoto Entertainment (Thailand) Co., Ltd. and Beijing Marathon in China in order to exchange runners. That showed we received recognition on international stage. So, we hope to welcome not less than 1,000 runners from Asian countries such as Japan, China, Singapore, Australia and Malaysia as well as the elite athletes from more than 20 countries across the world. The top three finishers in each category will receive special trophies with a design based on green turtle, while those who cross the line in marathon and half marathon classes get a “finisher” shirt from Compressport. Special promotion for “Early Bird”; Register & make payment before September 15, Marathon (42.195km): foreigner Bt3,000/90US$ (normal fee Bt3,500/105US$) expat Bt 1,600 (normal fee Bt2,000) Thai Bt1,200 (normal fee Bt1,500) 14 southern provinces Bt700 (normal fee 800); Half marathon (21.1km), foreigner Bt2,300/70US$ (normal fee Bt2,800/85US$), expat Bt1,200 (normal fee Bt1,500), Thai Bt950 (normal fee Bt1,200), 14 southern provinces Bt500 (normal fee Bt600); Mini marathon (10km), foreigner Bt1,200/70US$ (normal fee Bt1,500/45US$), expat Bt800 (normal fee Bt1,000), Thai Bt550 (normal fee Bt700), 14 southern provinces Bt350 (normal fee Bt400); Colour Fun Run, 5km Bt550 (normal fee Bt650), 2km Bt450 (normal fee Bt550), 1km Bt350 (normal fee Bt450) Jelly Beach RUN 5 km Bt500 one price for everyone. Registration can be made from now until November 10 here, or apply in person at Phukethon office (situated behind Sports Authority of Thailand’s Phuket Office) tel. 080-214-6950, 080-287-6515 or Khaimook Andaman Association tel. 086-689-8082. For more information, please visit the website, www.phukethon.com and Facebook page, www.facebook.com/Phukethon.